I look at my painting and realise I have never seen it in unbiased light. Its western side (and only now I realise that what I have been calling West and East are, in terms of the wall that supports it, not merely cartographically but literally so aligned) receives from the window much more light than its eastern. The northernmost few inches happen to fall in the shadow of the window top. Electric light is differently biased with the South of the picture descending into gloom. I must get a proper look at it in the more general light of my other studio where I shall see it, and occasionally hit it (in alternate games at least), from the far end of the ping pong table. It may serve also (in alternate games again) to distract my opponent, which will be useful in the return match against Dinos Chapman; after the decisive home win which marked our first encounter. 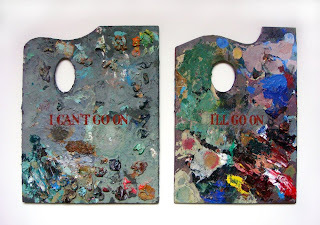 Meanwhile, looking to other tasks, I noticed last week two abandoned palettes in a corner, each in a different random mood and decided to make a diptych of them. What better text for them to share than another line from that sublime manufacturer of artists' mottoes, Samuel Beckett, to sum up the post magnum opus blues? I think these are wonderful and remind me a little of the 2nd World War poster "Keep Calm and Carry On"